Keep in mind, the measurments we went with were to fit specific pillows that I used for the cushions. You can adjust slightly to make them any size you want. We left one end of the bench open so that when the two benches slid together the cushions would be flush. First we created simple square frames for the legs and attached a brace in the middle. For the brace in the middle we used a pocket hole jig so the screws went in at an angle. 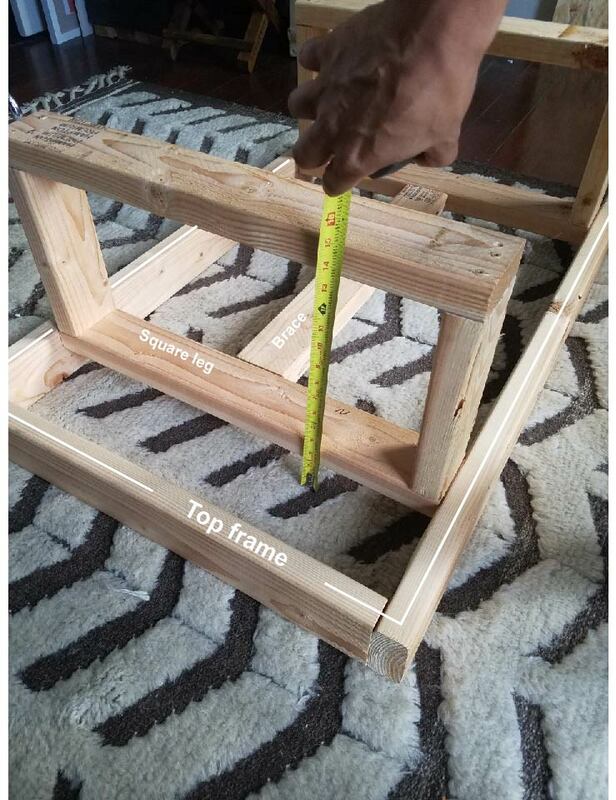 Once the legs and brace were attached together we flipped it upside-down, placed the legs on 2” blocks (scrap pieces of wood) to elevate it off the ground and screwed the top frame into the legs. Legs and brace are pictured upside-down. The measuring tape indicates 2” elevated off the ground. This way when the top frame is attached it will create a lip to hold the cushions. All of the stud, apart from the brace, were attached at the ends with 2 screws. Once the frame is complete the OSB can be cut to size and slide down on top. I know this is a pretty roughly explained DIY but I hope with the photos you can decipher what we did!